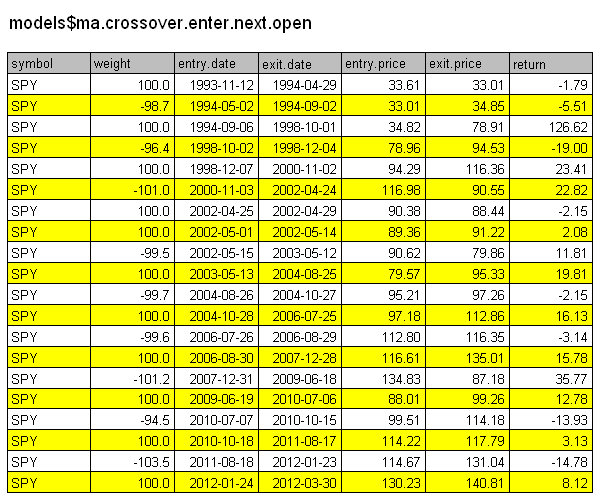 I came across a free source of Intraday Forex data while reading Forex Trading with R : Part 1 post. 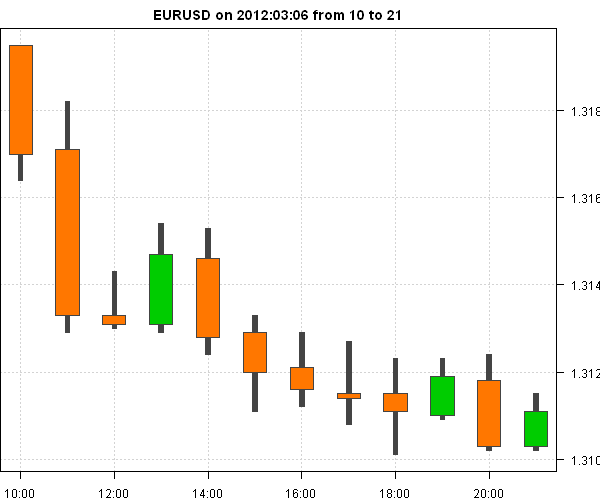 You can download either Daily or Hourly historical Forex data from the FXHISTORICALDATA.COM. 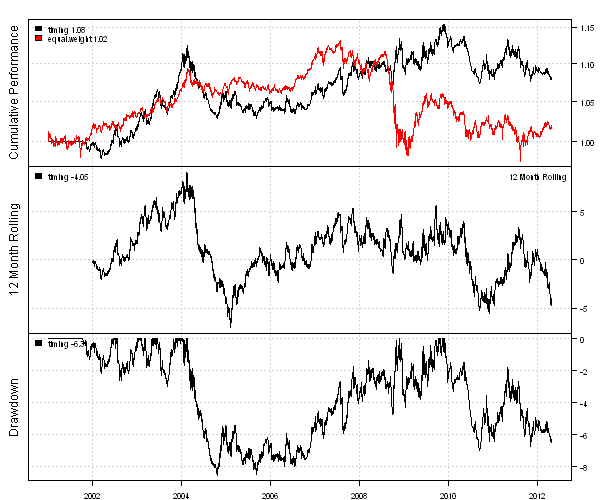 Next, let’s combine Daily price for SPY and Intraday quotes for EURUSD in one chart. Next, let’s create a Daily Backtest by investing into Currency Majors: EUR/USD, USD/JPY, GBP/USD, AUD/USD, USD/CHF and USD/CAD. I will investigate an Equal Weight portfolio and Timing portfolio as explained in the A Quantitative Approach to Tactical Asset Allocation by M. Faber (2006) paper. 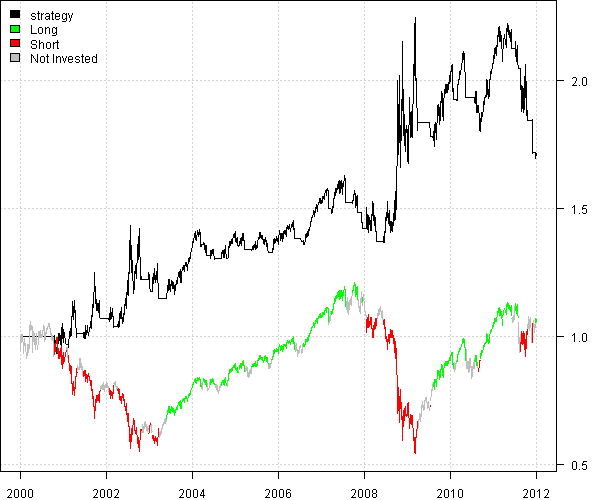 Next, let’s create an Intraday Backtest using the same strategies. 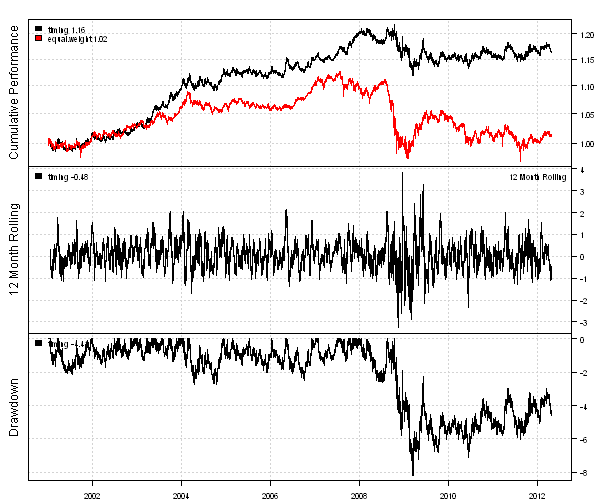 It is easy to work with Intraday data and it is easy to create Intraday Backtest, right? To view the complete source code for this example, please have a look at the bt.intraday.test() function in bt.test.r at github. I want to highlight two great Visualization techniques I discovered by reading the fine blog from Timely Portfolio. First method is based on the lm System on Nikkei with New Chart. 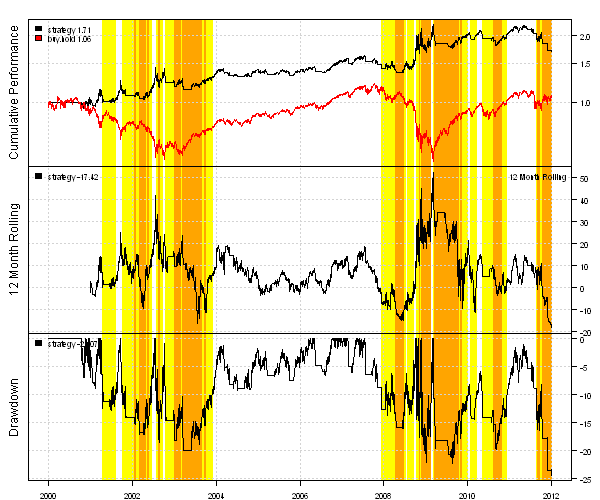 Let’s visualize Strategy’s Long/Short/Not Invested periods by highlighting the underlying (i.e. 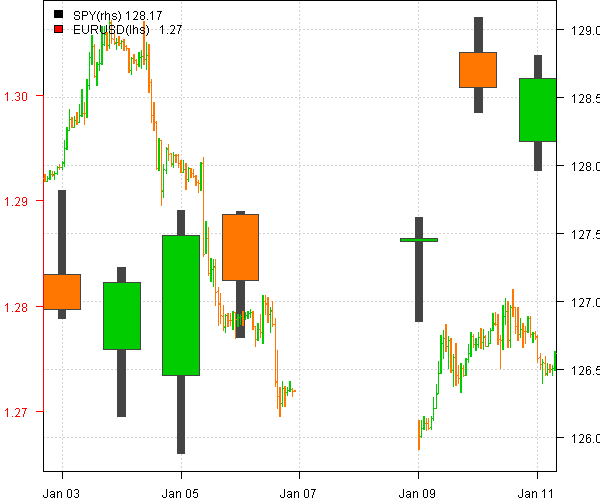 buy & hold) with green/red/gray. 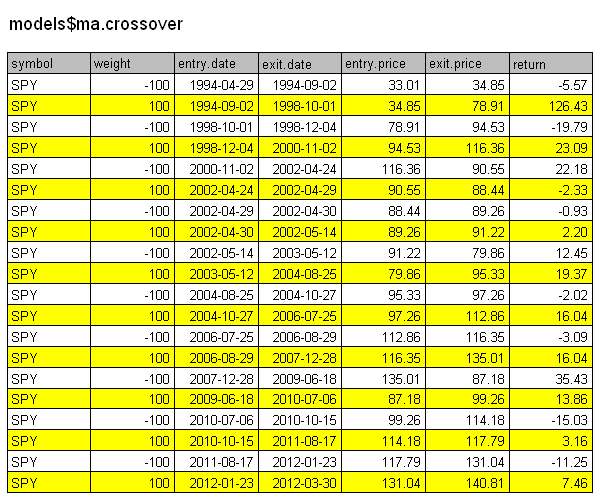 Following is a sample code that implements this idea using Systematic Investor Toolbox. We can visually attribute from the plot periods when Strategy is Long/Short/Not Invested. 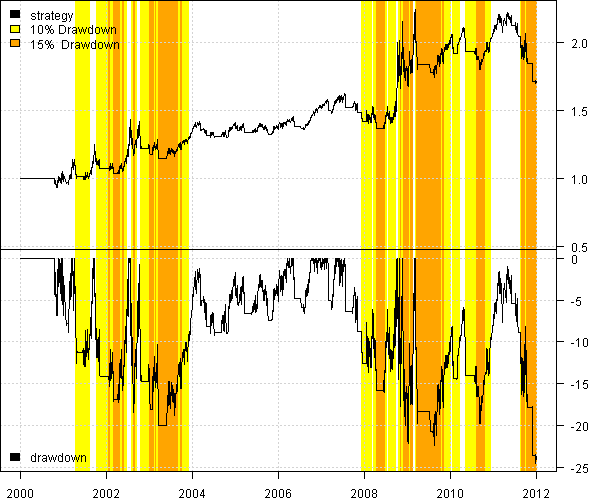 Another method is based on the Drawdown Visualization . Let’s visualize Drawdowns by highlighting periods when drawdown is large than 10% with yellow and larger than 15% with orange. The next logical step is to introduce highlighting into the backtest plots. This is extremely easy to do because I use plota library to create backtesting reports. Please let me know what other Visualization techniques do you use. 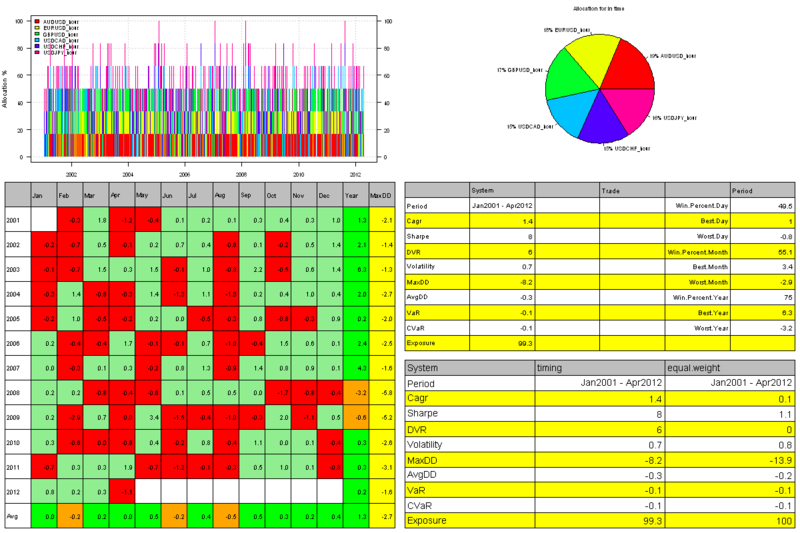 To view the complete source code for this example, please have a look at the bt.timelyportfolio.visualization.test() function in bt.test.r at github. 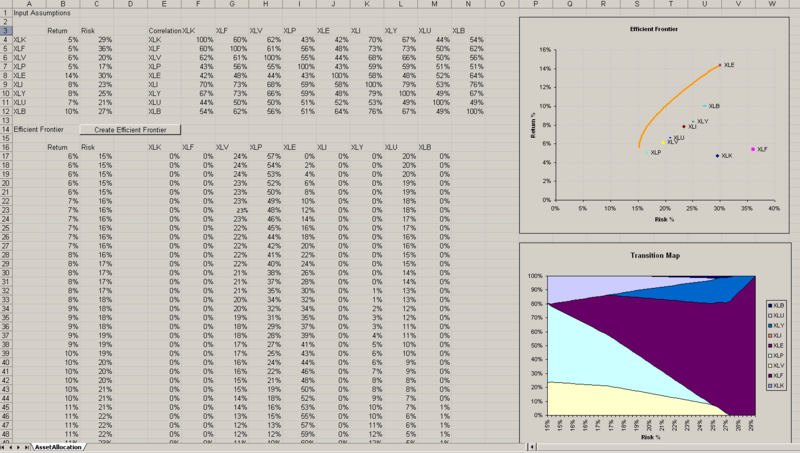 RExcel is a great tool to connect R and Microsoft Excel. 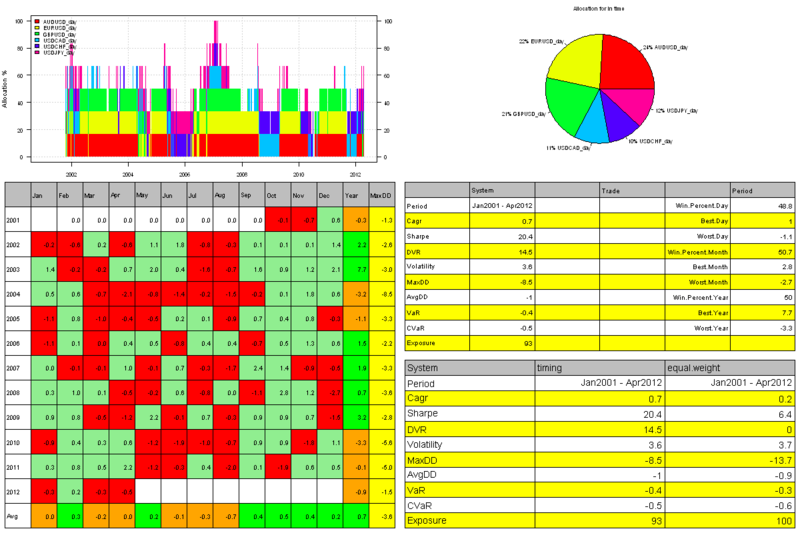 With a press of a button, I can easily execute my R scripts and present output interactively in Excel. This easy integration allows non-R users to explore the power of the R language. As an example of this approach, I want to show how to create an Efficient Frontier using Systematic Investor Toolbox and display it in Excel. You can download the AssetAllocation.xls workbook and experiment with it while you keep reading. Let’s put our Input Assumptions into Excel: Return, Risk, and Correlation matrix in rows 1:12. Let’s make a button at row 14 to construct an Efficient Frontier and associate it with our “create_efficient_frontier” VBA macro. The “create_efficient_frontier” VBA macro will collect our Input Assumptions from Excel and send them to the R environment. It will next execute the R script to construct the Efficient Frontier, and finally it will collect R calculations of Risk, Return, and Weights of portfolios lying on the Efficient Frontier and transfer them back to Excel. Here is the R script to construct the Efficient Frontier. I created a VBA function “create_rcode” to create this file automatically for this example. In practice this can be a static file containing all the logic for your algorithm. 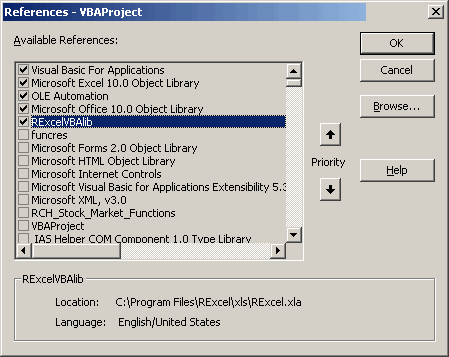 The “create_efficient_frontier” VBA macro will collect Input Assumptions and send them to R environment, it will next execute the R script to construct the Efficient Frontier, and finally it will collect the Risk, Return, and Weights of portfolios lying on the Efficient Frontier and transfer it back to Excel. Here is a complete AssetAllocation.xls workbook that creates an Efficient Frontier with user specified Input Assumptions. This workbook can be used by non-R users to explore the power of the R language, as long as RExcel is installed. I want to introduce the Transaction Cost and Execution Price functionality in the Backtesting library in the Systematic Investor Toolbox. The Transaction Cost is implemented by a commission parameter in the bt.run() function. You may specify the commissions in $ per share for “share” type backtest and as a percentage of total trade for “weight” type backtest. The Backtesting library in the Systematic Investor Toolbox was designed with an assumption that there is only one price at which securities are traded each day, by default I used Close prices. The Execution.Price field allows to override this default functionality. 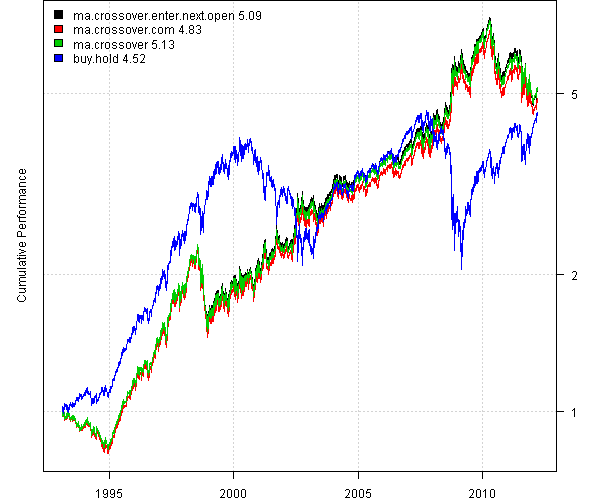 In the following example, I modified the 50 / 200 day moving average cross over strategy to Enter trades at the open the next day after the signal. To view the complete source code for this example, please have a look at the bt.execution.price.test() function in bt.test.r at github.